“Deputy Superintendent Dr. Tim Kaltenecker informed me the kids released 17 balloons when they said the names of the victims,” said Lamia. 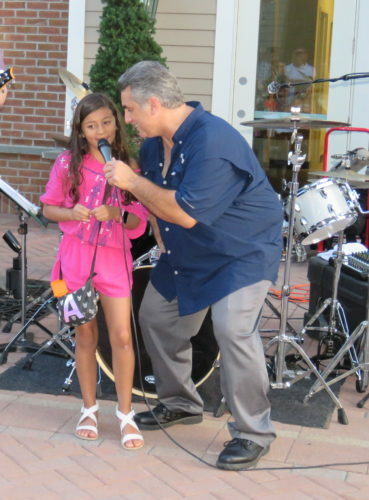 She relayed that the students at the high school organized the event with the building principal Chris Walsh. 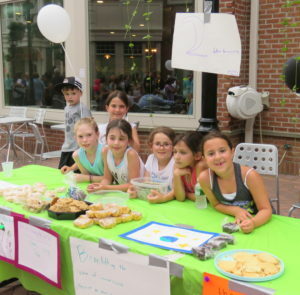 “The students gathered outside the front doors of the school and were reflective, quiet, and respectful,” she said. 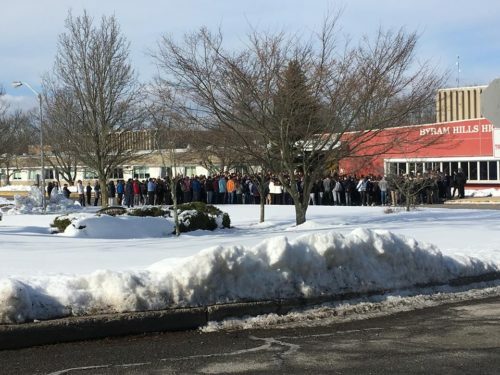 Lamia was on a board visitation to the H.C. Crittenden Middle School at the time of the Walkout; Deputy Superintendent Dr. Kaltenecker was at the high school. 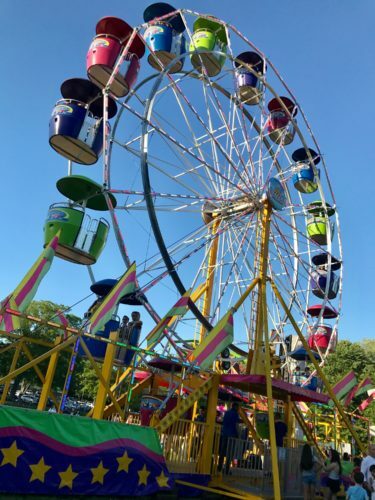 While not a student-organized event, per se (“Developmentally, the kids are too young,” said Lamia), at Wampus Elementary School, the teachers engaged the children in acts of kindness activities. 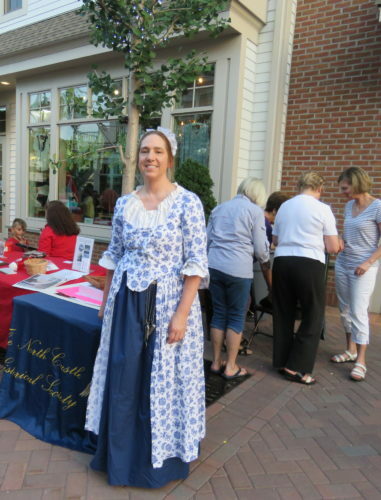 Friends of the North Castle Public Library holding court. 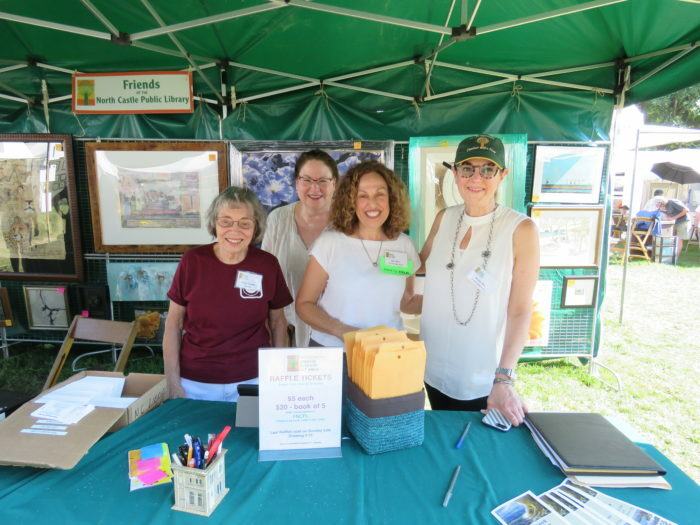 On Business Park Drive, the sun shone brightly and visitors either strolled or boarded a complimentary shuttle bus all eager to arrive at the North Castle Community Park for the 56th Annual Armonk Outdoor Art Show (AOAS) on September 23 and 24. 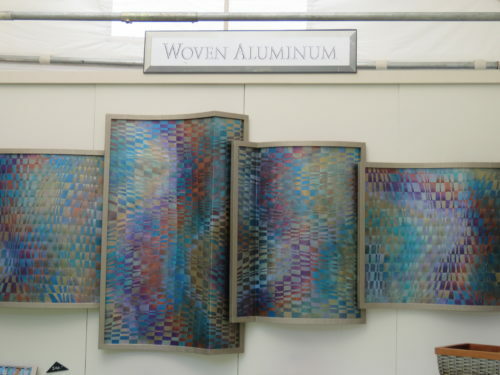 With over 300 volunteers, more than 185 artists and excited attendees from near and far, this award-winning fine art and fine crafts show served as a warm and welcoming family attraction. 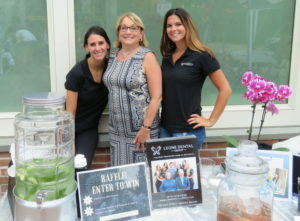 Corporate sponsors including Equinox, Houlihan Lawrence, Northern Westchester Hospital, and White Plains Hospital Medical and Wellness offered info and demonstrations. 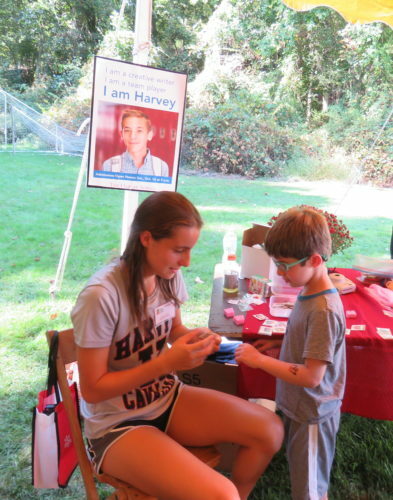 Family Activities sponsors included the Harvey School, First Five Learn and Play and the Neuberger Museum of Art provided wonderful activities for children of all ages. 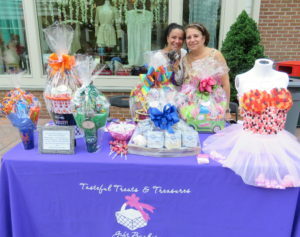 Silver corporate sponsors included William Raveis, Burke Rehabilitation Hospital and Framings. 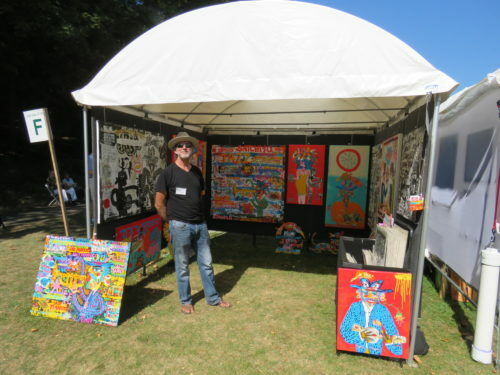 For a full listing of sponsors, visit armonkoutdoorartshow.org. 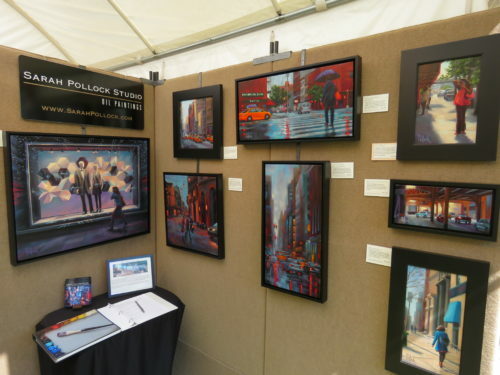 Awards were also presented to artists in seven categories and there were two additional special awards with $1000 prizes. 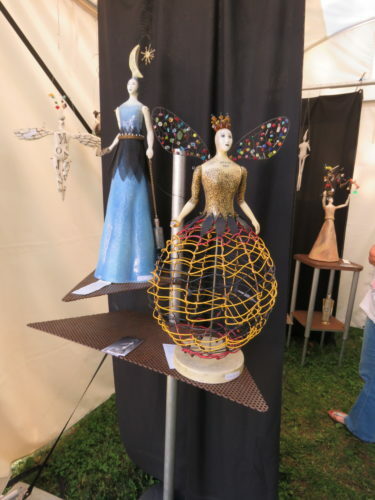 The Alan C. Solomon Best of Show Prize went to honor the artist who “exemplifies creativity, artistic talent and mastery in his/her artwork across all artistic categories.” It was awarded to Bounkhong Signavong, the founder of Lao Design. The Sylvia Rogers Best New Artist Prize “to attract new artists to the AOAS and recognize the talent and imagination of up and coming artists,” was awarded to Cuban born Enrique Miralles, who exhibited a powerful collection of dry point etchings. 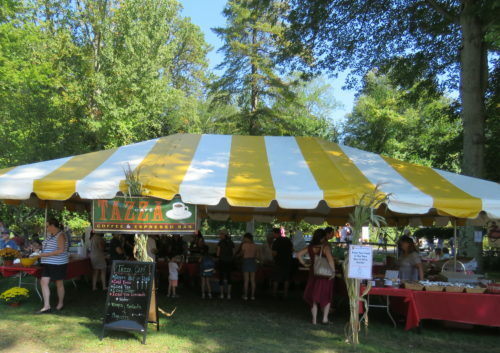 The weather on both days was absolutely gorgeous, if a bit toasty and kept guests sipping on iced drinks to keep cool and partaking in delicious foods from area vendors. 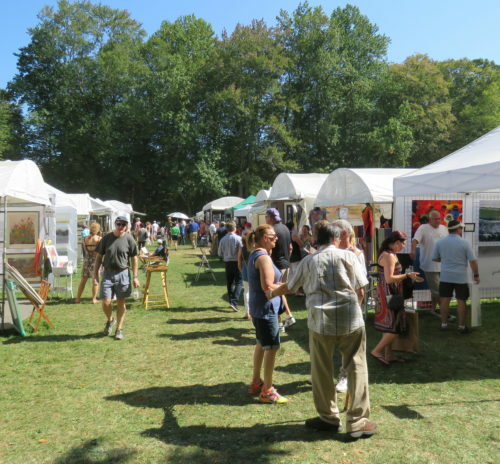 It offered a day of exploration for all with many visitors picking up original pieces of art wear, paintings, and sculptures created in a variety of mediums to treasure for many years to come. 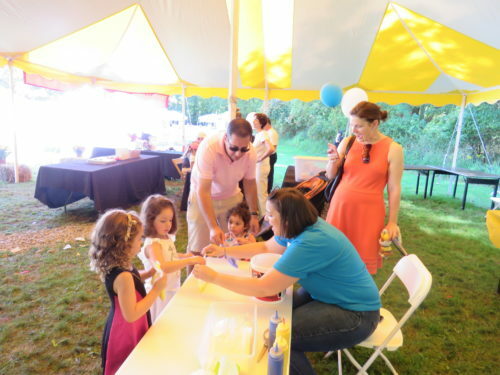 If you missed this event, come next year when the 57th annual AOAS will be held on September 29 and 30. 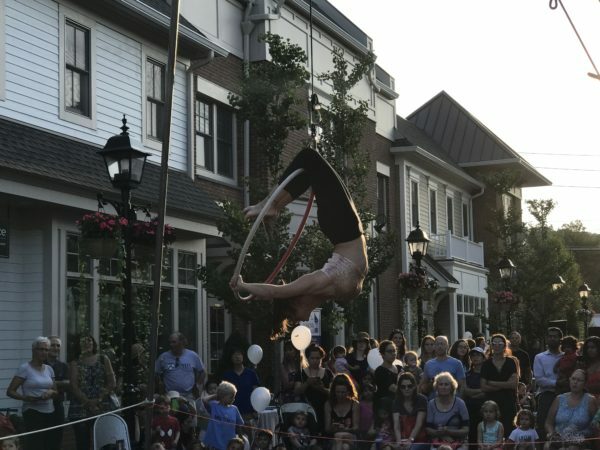 The final Third Thursday on August 17 in Armonk was the first of its kind: a unique circus extravaganza featuring immensely talented and expertly trained performers. 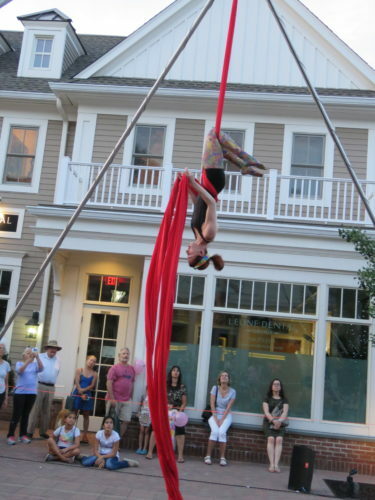 Armonk Square was the setting for an event with a distinct town fair feeling as cheerful, hard working Westchester Circus Arts staff spent hours engaging hundreds of residents and visitors alike–bringing to the Square magicians, performers on stilts, and most mesmerizing of all, the main event: the company’s highly elegant and sometimes gasp-producing aerial performances. 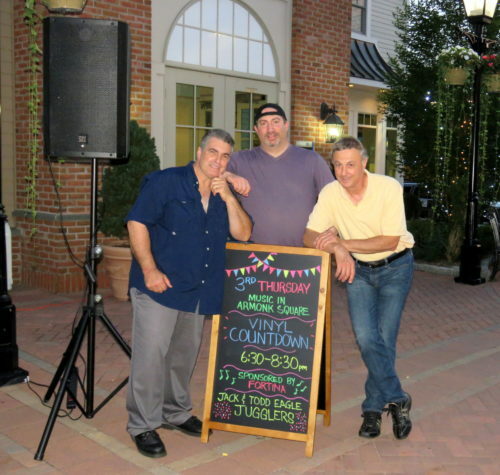 Attendees also enjoyed a tightrope walking workshop, a chance to watch jugglers and generally to experience pure magic as kids and grown-ups eutger danced near Main Street too at the front of the Square while humming or singing along to a festive lineup of 80s, 90s and contemporary favorites by the three-member band, Vinyl Countdown. 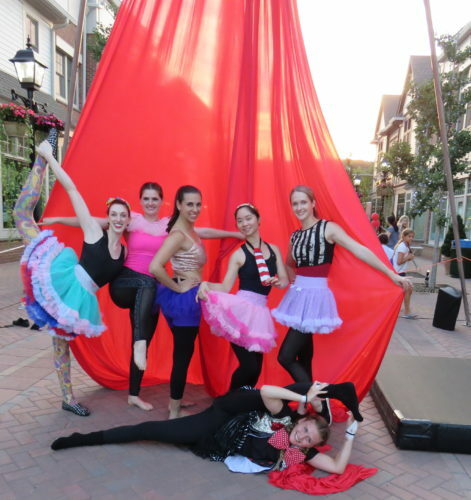 From their Tarrytown, N.Y. location, Westchester Circus Arts has five awesome instructors and teaches classes to the general public. 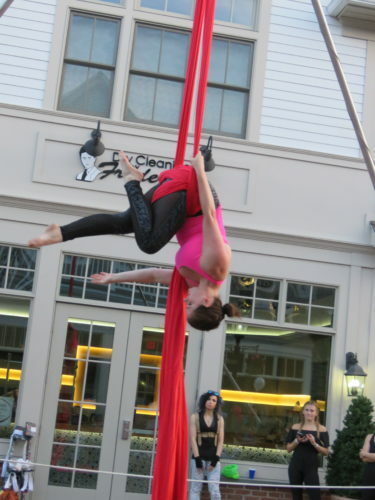 Inside the Square, WCA staff used a hoop, trapeze, silks, and more to capture their audience’s imagination and attention! 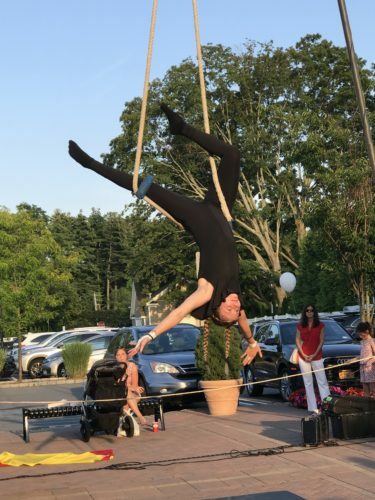 With the trapeze hanging from four sturdy posts, attendees applauded and cheered as Westchester Circus Arts’ best performers and instructors quite simply, wowed the crowd. The intricate moves were flawless and had some viewers staying on or returning back to the Square to catch additional performances. Each performer showed off her best routines for about five minutes, with shows starting at 5:30 and continuing every half hour or so. 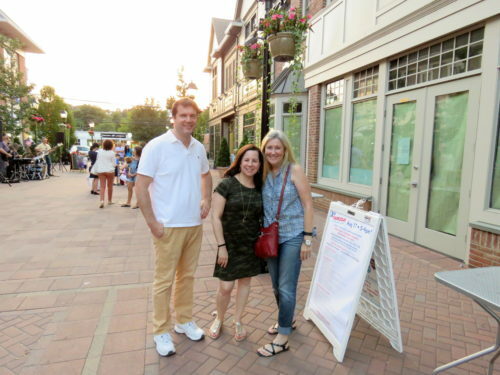 Indeed, walking into the small Square in downtown Armonk on a Third Thursday has started to feel like entering a circus tent, as live music carries cheerful vibes into the air and the sounds of laughter and a community coming together is heard and celebrated. 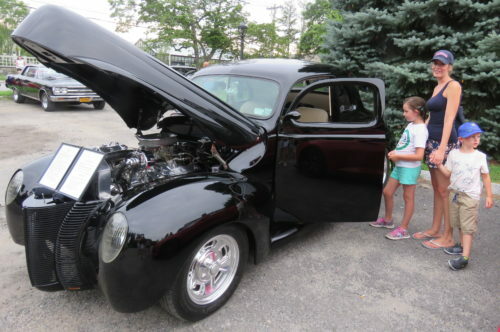 Families have ventured out for a chalk art contest, a chili cook-off and a classic car show through the streets of Armonk, all hosted by the Chamber. 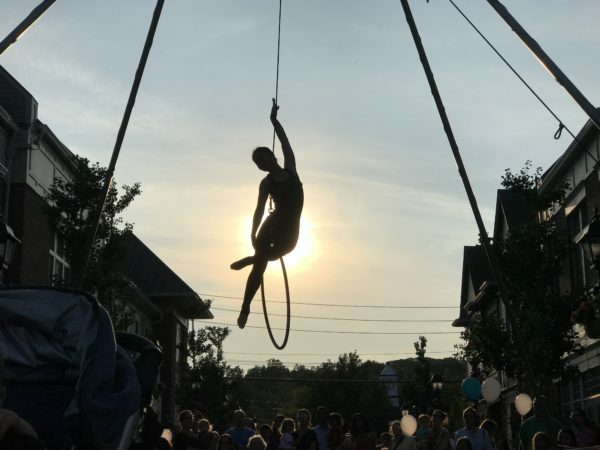 Stacy Wilder, the Director of Communications, said Third Thursday is a town favorite and attendance peaked thanks to the wonderful street performers adding to an impressive grand finale on a ‘final Third Thursday’ night in Armonk. 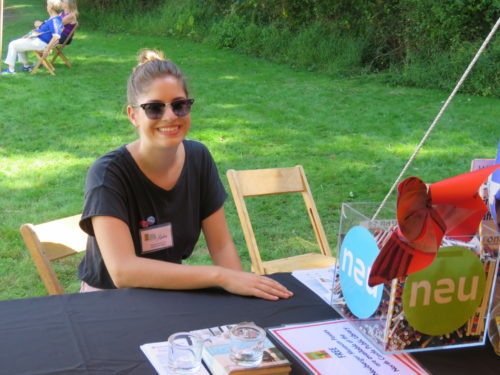 Molly Alexander, a rising Senior in the LIFE School at Horace Greeley High School, is an intern for Inside Chappaqua and Inside Armonk Magazines. 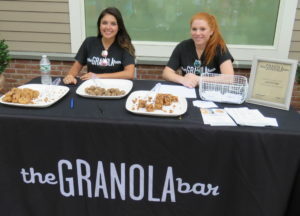 Anyone who came to take in Armonk’s Classic Cars Show–the highlight of Third Thursday festivities in and around Armonk Square–received a special treat. 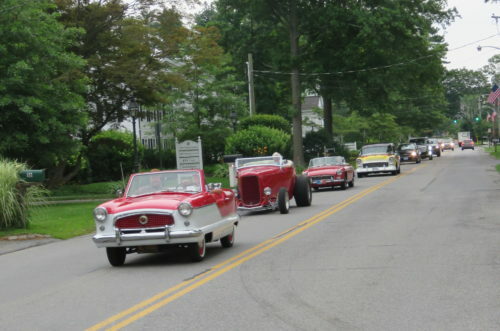 From the corner of Bedford Road and Main Street, 35 Classic Cars could be found circling a bunch of times around the main thoroughfares; there was friendly waving and thumbs up from area spectators, and just as often, waves back from proud and friendly owners seated behind old time (although some new, too) fun and funky wheels. 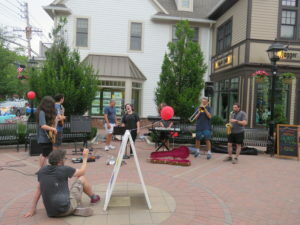 I imagined they were feeling pretty groovy with all the fanfare. 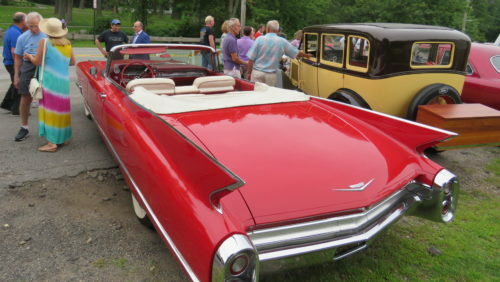 And it seemed definitely such for Andy Block and his own special toy: a 1960 Red Cadillac, a “series 62 convertible,” he noted. 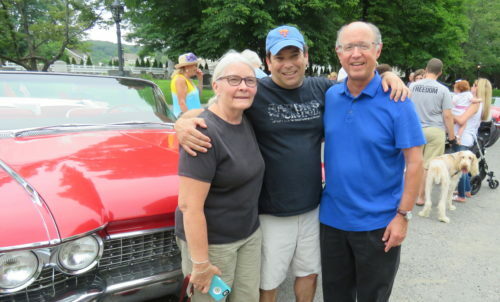 Block, a 23 year resident of Armonk, generously shares his car too: he annually rides it in the town’s early winter Frosty parade and has offered rides in it “to ladies at events for the North Castle Historical Society.” His two kids, 23 & 21, he said, are “used to their father’s hobby. They want me to get buried in it,” he quipped. 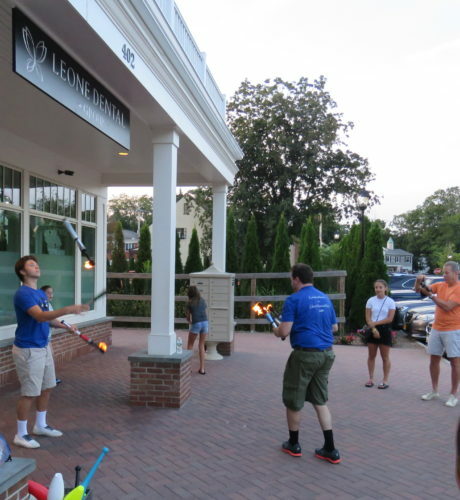 Save the date August 17th for 4th Thursday!